RVs are welcome for overnight parking and camping. The usual RV parking lot is currently closed due to the construction of the new hotel tower, so they are asking RVs to park in the top lot. This is gravel, and slopes, but has a magnificent view out over the whole Capay Valley. We drove the toad down to the casino each time and used the free valet, but there is also a free shuttle. You can walk from the RV lot down the drive way to the road and flag it down, or just call the hotel desk. It runs 24 hours. They still have the deal of getting $25 per person credit if you sign up for the players club. That buys two buffet dinners on a weeknight or one and a half on weekends. The buffet is excellent. Security patrol met us shortly after arrival and escorted us to the uppermost car park where we found a reasonably level site, only needed a 2 inch board under one side, nice view overlooking the casino and valley. Bus shuttle to casino approximately every 15 minutes - 24 hours, to return simply ask valet attendant to call shuttle. New members receive $25 card which can be spent on anything except gaming or alcohol - we had an excellent buffet dinner for two and when leaving in the morning used the other card for gas! Fuel station has only one entry/exit, so may be a bit tight for big rig with toad. Stopped here for one night on our trip south to Palm Springs. RV parking is North of the Casino close to the Fire Hall. 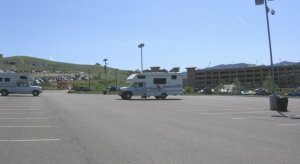 The parking lot isn't huge but there was plenty of room for the 5 RV's that were parked overnight. 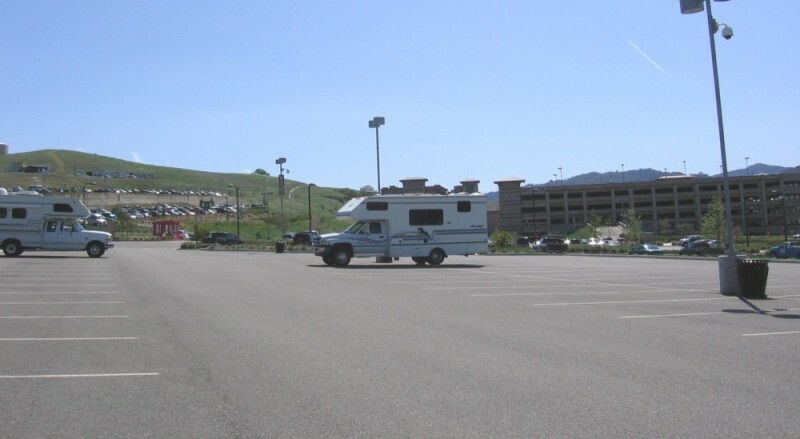 The lot slopes two ways so no matter how you park you are going to have a job levelling your RV. The casino is a bit of a hike off I5 and very rough which gave everything attached to or in our trailer a good shake up. The lot was patrolled by security but no one stopped to talk. Casio gives new players a $25 credit for gas and food. Had supper at the buffet my card covered me and my wife with $1 left. Bought gas when the truck was unhooked would not attempt it with trailer or motor home. 2-3 hours south-west of Rolling Hills is another Indian casino, officially called Yocha Dehe , it is located on Hwy 16, north off I-505, the freeway bypassing Sacramento from the north joining I-5 to San Francisco. Easy enough to find, Cache Creek is enough off the beaten path to eliminate most truckers. Becoming a theme of my casino camping career, I made a wrong turn en-route leading to an unscheduled tour of local farmlands. Roads were getting so small that I thought maybe they would run out in a field somewhere (a concern for me because I can’t reverse to turn around with the Jeep hooked up). Eventually I made a 10 mile circle and got back to the highway. On arrival, I parked in the south lot as it was large and fairly flat, although a fair hike to the casino. Once there, a friendly security lady told me that RVs should go to the north lot, around the other side. This I did and found a few other campers on a sloping, paved surface underneath the local fire hall. Using a single board under each downside tire and the air-levelling system, I managed to flatten out. Almost immediately, a shuttle bus arrived to take me to the casino. An excellent service, these continued all evening and for all I know, through the night. The buffet, at $11.95, was exceptional, as most of them are, so I pigged out and returned “home” to rest in my chair in front of the TV. The buffet is closed on Wednesdays and Thursdays. In total, there are 8 food outlets including a Chinese restaurant, steakhouse Grill, a deli, sports bar and others that I forget. New patrons to Cache Creek are given a $25 credit on their Player’s cards. Strangely, these are designed to be spent only on secondary services such as food services, gift shop, even fuel at the service station plus golf, but not for gambling. I didn’t totally understand the rationale here but happily chowed down two meals for free and then, in a fit of remorse, donated $10 to one of the slots. Golf, at $90 was a little rich for my blood, so I decided to pass on that. The course, just up the hill from the casino, appeared very picturesque. Cache Creek is the biggest casino that I have ever seen with slots and table games stretching to the interior horizon. It also has a huge, city sized parkade for valet-parked vehicles. Primarily it seemed to cater to an Asian market coming in tour buses, one presumes, mostly from San Francisco and also Sacramento, which is not far to the east. A local side trip takes one to an olive-oil plant run by the tribe. I was out of season but the opportunity to purchase something was certainly there. Still $25 food credit for joining club, almost enough for lunch+dinner buffer (different days). Buffet was good (fincier than some) and would have been worth the asking price. RV lot B is up the hill by the fire station. Lots of RVs the weekend I was there. Walking to casino required cutting through the parking structure. (alternate was walking in the road) Needed to ask valet to call for shuttle back. No non-smoking area in casino.